Chrome Azzaro for men is a great investment. It has a clean, fresh smell, and though It's for men, it can be worn by women. It's a show stopper and a head turner. I bought it before now and would buy it again. Chrome is not meet my expectation. 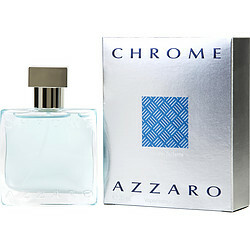 Chrome Azzaro for Men- I can honestly say I have never smelled anything like it! It is Amazing! The scent stays with him for hours! When I am at work if I get on an elevator, I can immediately tell if a man is wearing it even if the elevator is empty!